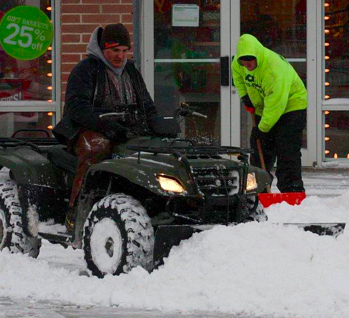 Some property managers prefer to pay per push: snow falls, the crew clears their grounds, they receive a bill. Other clients like homeowners’ associations want to know what the cost for snow services will be every month. So a seasonal contract is more palatable, plus they aren’t thinking about invoices from a contractor every time the snow flies. We believe in educating our clients about the snow and ice management services we offer for their Ohio commercial properties so they understand what’s involved in keeping their parking lots, driveways and sidewalks safe. At the end of the day, the way you pay for the service is not the real issue. It’s about making sure that the job gets done. You want surfaces to be clear of snow and ice on time and continuously during storms so that the people who live, work and play on the property stay safe. But of course, there’s a cost to clearing snow and ice. 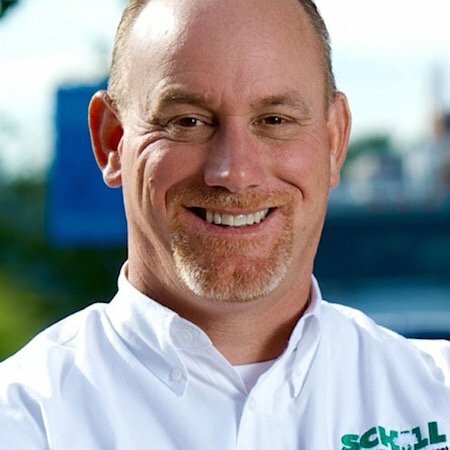 Here are the three ways that commercial property owners ask Schill to structure snow removal contracts, and the benefits of each fee structure. Want to know more about keeping your property safe this winter? 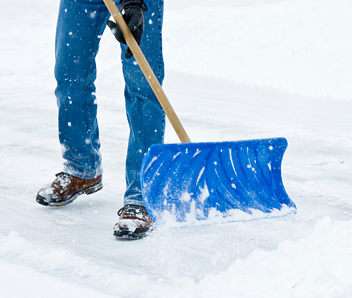 Check out our snow removal guide for property managers and owners. This contract is for the property manager that wants to pay for snow removal services if and when the snow falls. If there’s no snow, these clients are not billed. But if the snow flies, our crews are on call once accumulation is 2 inches or more. Two inches of snow is generally when we push the “go” button, unless you’re on a robust full-service plan — see below. At Schill, we structure the per-push pricing based on snow depth. There’s a price “per push” for 2-4 inches, 4-6 inches and 6-8 inches of snow. That’s because we know that our team will spend a lot more time clearing 6 inches of snow from a retail parking lot than 2 inches. The snow is heavier, and there’s more of it to maneuver around the property. Because we dispatch crews immediately—response time is critical in this industry—we always aim to clear 2 inches rather than 8. We don’t want the snow to build up on your property. Big storms will require multiple pushes per property to ensure it stays clear and safe. The clients who generally prefer a per-push contract are often retail property managers. They like the service delivered in an “itemized” way—a monthly tab of snow events and times of service. And, these clients may benefit if we have a mild winter. However, because Schill seasonal agreements are three-year contracts, clients don’t “win” by choosing per-push or seasonal. The choice mostly comes down to budgeting. Do you want to pay a fixed price, or per push? Our seasonal contracts include a fixed price per month for snow services, and the contracts are active during the five winter months in Ohio for three years. We find that a multi-year contract give clients the best value. During one winter, we may get only 20 events in Northeast Ohio. Or, like last year we could have one of the worst winters ever. Over the period of a few years, the snow events per year average out. The constant price is what property managers of homeowners associations and other commercial sites love about seasonal contracts. They don’t have to worry about snow removal costs fluctuating from November to March. The bill is always the same. A seasonal contract is ideal for budget-conscious clients who recognize that the Schill team will be on the property to plow snow once accumulation is 2 inches. For properties that are high-risk and heavily traveled, there’s no room for error with snow and ice management. They need clear parking lots and walkways all winter, no matter the conditions. They require response before, during and after a storm. This means utilizing the appropriate equipment and materials, and dispatching dedicated crews that are trained and experienced. For these clients, which often include corporate properties and hospitals/healthcare facilities, we provide zero-tolerance snow and ice removal. We want these clients to see their pavement all year. That means pre-treating before winter storms and using our innovative ice-melting products to maximize the results of snow removal. Whether the weather calls for snow, hail or below freezing temperatures where ice is a risk (and dangerous slip-and-fall accidents), these property owners know they’re covered with this full-service contract, which is a 2- to 3-year agreement. This goes for other snow contracts with Schill, but the full-service aspect of this agreement means Schill is essentially your winter partner, on site as soon as the Doppler radar indicates that a storm is near. We understand that budgeting for snow removal services requires planning, and some clients prefer a flat fee while others prefer to pay per snow event. It doesn’t matter what type of contract you choose, just be sure the professional who will clear snow on your Northeast Ohio property is qualified, experienced and prepared. If you need a little help in hiring a reputable Cleveland snow removal company, use our FREE guide to hiring a snow removal contractor today. As one of the top three Ohio snow removal contractors with the most ASCA certified employees on staff in the state, we take snow seriously. And we believe it’s critically important to educate our clients about the risks associated with careless snow services. Ultimately, commercial snow removal in Cleveland is emergency response: It’s all about protecting the safety of people who visit, work and live on your property. Let’s talk more about how you can budget for snow removal this season, and what to look for in a quality contractor. Call us any time at440.327.3030, or fill out this simple contact form and we’ll get in touch with you.